The Considerate Constructors Scheme launched its Best Practice Hub on the 13th January 2015 and in just 6 months has had a formidable uptake. Created in accordance with the Scheme’s Code of Considerate Practice, the Hub is a unique database available to anyone free of charge, hosting a wealth of best practice examples, innovations and case studies to help constructors learn from their peers and raise standards throughout the industry. In a recent survey the Hub was described as “really useful” and an “excellent source of ideas.” The findings from the survey were hugely positive with 100% of people surveyed saying they would recommend the Hub to others in the industry and 97% confirming that they found the Hub a useful resource for searching for examples of best practice. The Hub has continued to develop and expand, and during the first 6 months there have been several new additions and improvements made. This section highlights relevant calendar dates which can be used to raise awareness and increase interaction with the workforce and the community. For example you can see what can be done to support Grown in Britain week in October. Click here to visit the Important Dates and Events page. The Scheme Resources page includes information and links to posters, films and training documents available to registered sites, companies and suppliers. Support and guidance is available to gain a better understanding of the Scheme’s Code and aims to raise the image of the construction industry. Click here to visit the Scheme Resources page. This Leader board highlights the companies and individuals who have submitted the highest number of entries to the Hub. 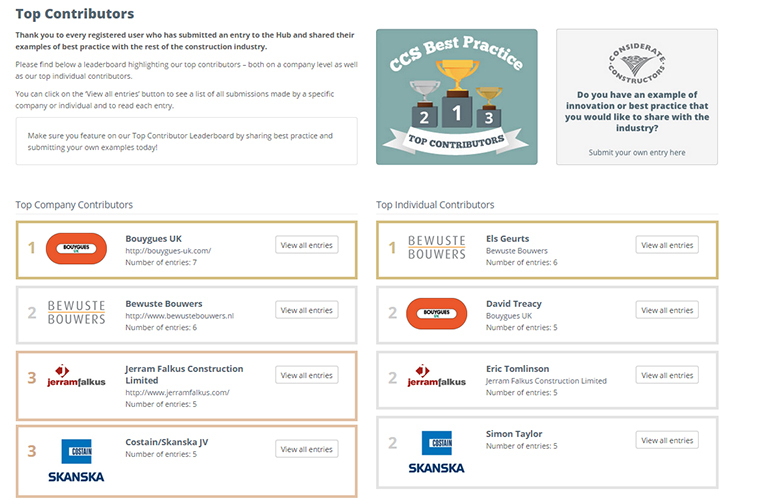 Bouygues UK is currently the Top Company Contributor with 7 entries and Els Geurts is the Top Individual Contributor with 6 entries. Click here to visit the Top Contributors Leader board.